Longyan Eteng Eletronics Co.,Ltd is a adhesive tape manufacturer in P.R.China. we can coat condutive acrylic adhesive or non-conductive acrylic adhesive on 0.018mm, 0.025mm,and 0.05mm copper foil, and roll it on 76mm core or 38mm core.We can slit tape into MIn. 3mm width or die-cutted into round shape or other shape as drawings. The acrylic adhesive is strong enough, can adhere to not only metal plate but also concrete. Part number ET-7035 is 0.035mm thickness pure copper foil coating with conductive acrylic adhesive. The purity of copper foil is higher than 99.95%, and its function is to eliminate electromagnetic(EMI) interference, isolation of electromagnetic waves on the human body injury,avoid unwanted voltage and current without affecting functionality. 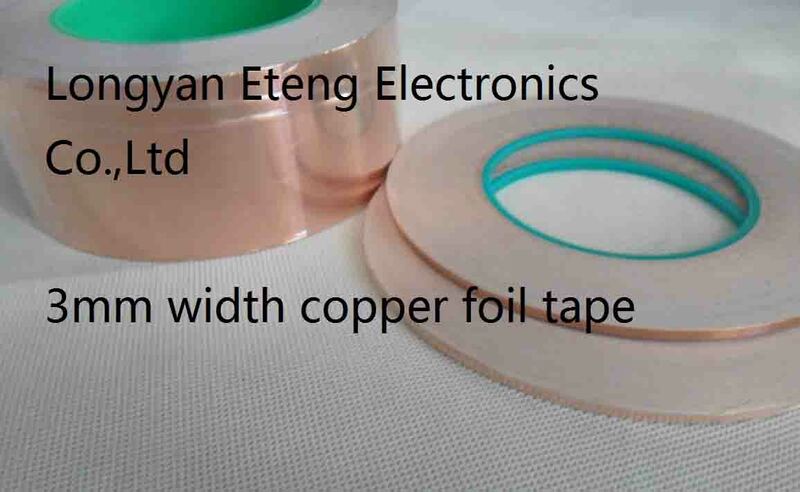 The conductive copper foil tape is good conductivity at surface resistance of 0.05Ω ,The conductive adhesive can be strongly bonding with any metal surface,make electrical closed and fill electric lap and gap.In addition,electrostatic discharge after the ground has a good effect.Paste strong,good electrical properties, according to customer requirements cut into a variety of specifications. Besides,backing adhesive on copper foil has many uses form Artwork ,such as stained glass artist, picture borders, doll houses, Miniatures, or a special tape on that once in a life gift , to industry, to Music ,the back of pick guards & shielding cavities, eliminating electrical hum and noise. and can be use on clear, non-opalescent glass and mirrors to match visible internal foil with soldered seams. Ideal for transformer, mobile phone, computer, PDA, PDP, and LCD monitor, PC, guitar,copier,wrapping cable,to barrier slug or snail etc.